HAVE YOU ALSO TRIED OUR APP? 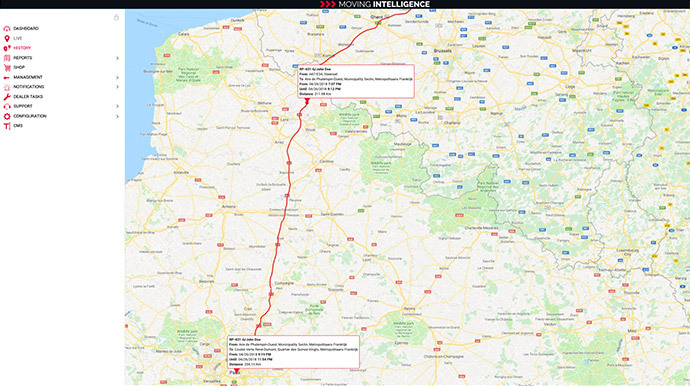 With the free Moving Intelligence app you always have insight into the trip logs and real-time status of your coupled vehicles. With the Live Tracking service you always have a single, real-time overview of all your vehicles and objects. 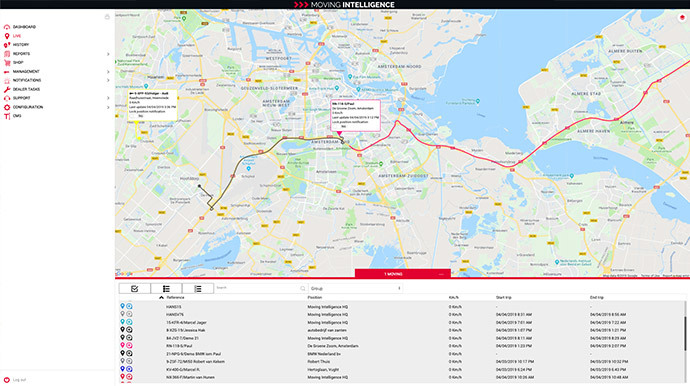 The unique web-based Moving Intelligence platform offers the most advanced services in the areas of equipment and vehicle security, route registration, vehicle fleet management and sustainable mobility. All products and services are integrated into our online platform and are thus always up-to-date and available in real time. 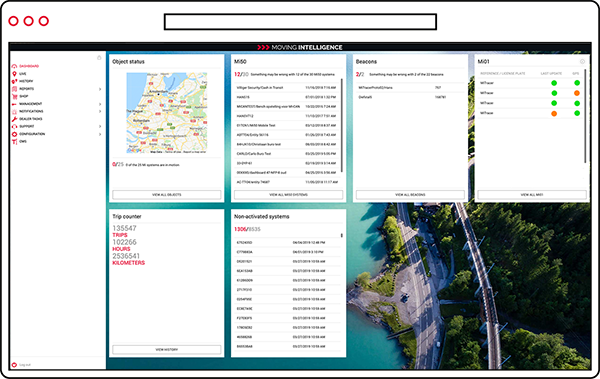 Whether you want to organise and manage your route registration, obtain or track (live) the current location of your vehicles, equipment or other mobile objects, the Moving Intelligence platform combines all the relevant mobility services and data in a personal account. 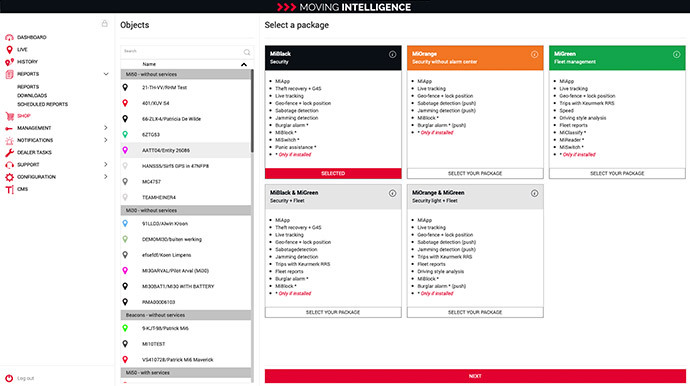 After acquiring and installing a Moving Intelligence product, customers can choose, activate or cancel the desired package and terms themselves from their personal account. The personal dashboard forms the basis of the online platform. The current status of all vehicles, vessels and/or other mobile objects is supplemented with the latest (industry) news on the dashboard. From here, you can go directly to the desired section within the platform via the menu. Here you can choose from Live Tracking, History, Reports, Shop and Management. Live tracking is the basis of state-of-the-art vehicle fleet management and logistics services. With the Live Tracking service you always have a single, real-time overview of all your vehicles and objects. All current information such as engine ignition on/off, speed and driven distance are displayed in a highly detailed chart and in a table summary at the bottom of your screen. Live Tracking is active across the whole world at the same rate. Want to track your systems in real time while on the road? Live Tracking is also available in the MiApp (for iOS and Android). Route registration and mileage administration can be a time-consuming affair without a reliable route registration system. With the Mi40 trip logging system and Mi50 vehicle tracking system, all business and personal kilometres driven are accurately recorded and tracked in a clear and organised manner. Customers can access the route registration with a mere keystroke in their personal account and can generate the correct reports directly from there. Want to see where and when each vehicle was driven? Which ID tag was used for a trip? How long a vehicle stood still at a certain address? Or do you want to analyse your employees’ driving behaviour in order to limit unnecessary costs regarding wear and tear or fuel consumption? 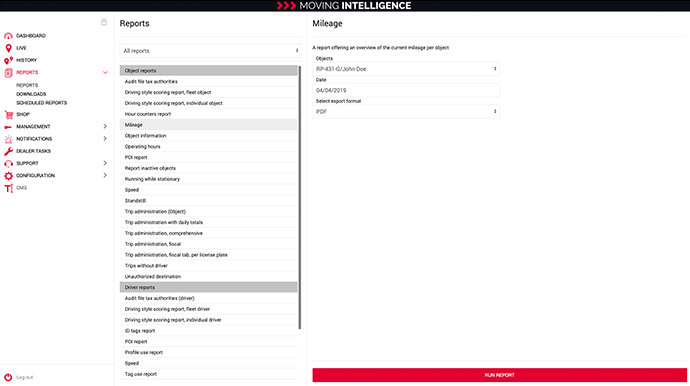 You can download the most varied of reports within your personal account on the Moving Intelligence platform. These Moving Intelligence services save time, money, energy and fuel and give you insight into your entire vehicle fleet. Note: Which reports are available within your account depends on the package that has been activated. After the system has been installed, the customer has to create an account on the Moving Intelligence platform. Once the account has been created, the desired package and its term have to be activated in the Shop. In just a few easy steps, the customer activates the package for the installed product. You can do this very easily by clicking on Shop in the menu, selecting the object and then activating the desired package.